The origami samurai hat, also known as a samurai helmet, is a great traditional model that is so simple to make, and fun to wear! If you want to make a wearable hat, you'll need to use a big piece of paper! For a printable Pdf version of the samurai hat instructions, click here. 1. Start with paper white side up. 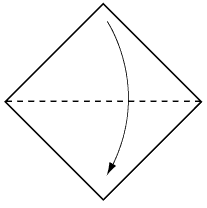 Fold in half downwards. 2. Fold outer corners in to the centre. 3. Fold top layer only upwards in half. 4. Fold top layers outwards along creases shown. 5. Fold top layer only upwards along the crease shown. 6. Fold same top layer upwards gain. 7. Fold the bottom layer upwards to crease, and open again. 8. Tuck this layer into the inside of hat. Learn to make other great models just like the origami samurai hat.